It would be a good idea, during May, for families to say the Rosary together. Prayer strengthens family life. For Catholics, praying with Mary has long been part of our tradition and every child should know this prayer by heart! 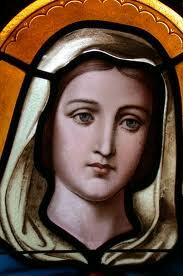 Of course, all devotion to Mary leads ultimately to the Lord, but she is our model and guide. The rosary consists of twenty decades. Each decade focuses upon a particular mystery in the life of Christ, Mary, and the Church. It is customary to say five decades at a time, while meditating upon one set of mysteries. Begin the Rosary with the Apostles' Creed followed by the Our Father, three Hail Marys and the Glory Be. Then enter into the first Mystery. With each decade, begin on the large bead with the Our Father. Pray ten Hail Marys. End with the Glory Be. Pause for a moment before going on to the next decade. As you pray each decade, meditate at the back of your mind on these Mysteries and allow the Holy Spirit to lead you to deeper insights into your faith. This lovely traditional Catholic prayer offers Mary a special place in our hearts. It's presented here in its traditional form. Hail, Holy Queen, Mother of mercy, our light, our sweetness, and our hope. And likewise this traditional prayer. implored thy help, or sought thy intercession was left unaided. Inspired with this confidence, we turn to thee, O Virgin of virgins, our Mother. To thee we come, before thee we stand, sinful and sorrowful. but in thy mercy hear and answer us. Amen. Traditionally prayed at the noon hour, this prayer can be recited in common individually. It is presented here in it's original verse form. Be it done unto me according to thy word. may by his passion and cross, be brought to the glory of his resurrection, through the same Christ our Lord. Amen.